Two circles inscribed into arbelos as shown below, have been proved to be equal by Archimedes in Lemma 5 of his Book of Lemmas. For this reason, the two circles are known as the Archimedean twins. 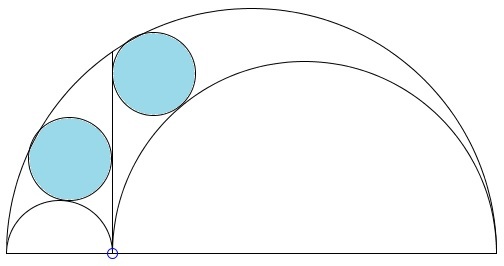 There are other configurations where a pair of equal circles pops up. Some of the related theorems that tackle a pair of equal circles have been given rather descriptive names: the Eyeball theorem, the Praying Eyes theorem, the Squinting Eyes theorem, the Eye-to-Eye theorem, etc. Only recently the two configurations have been brought together. Continuing in this path of pursuing ophthalmological metaphor, Dao Thanh Oai and Emmanuel Antonio José García found additional Archimedean circle within and some outside, the arbelos. Below I explain the costruction of the new Archimedean siblings, mostly with just a reference to one of the ophthalmological theorems. 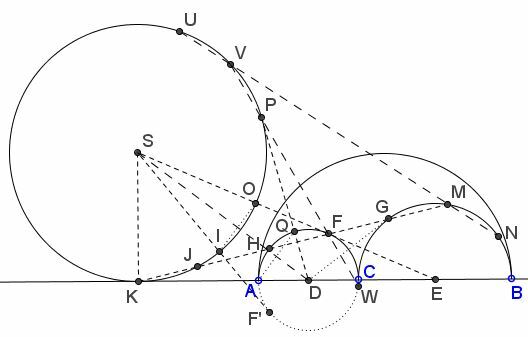 $SF'$ is the second tangent to semicircle $(AC)$. $DP$ is the second tangent to $(S)$ from $D,$ with $P$ the point of tangency. Now for the circles - the Archimedean siblings. $(IO)$, $(AQ)$ (Focus on the Eyeball theorem, #7). The above is a reproduction of a private mail message (August 29, 2014) by Emmanuel Antonio José García (Dominican Republic). 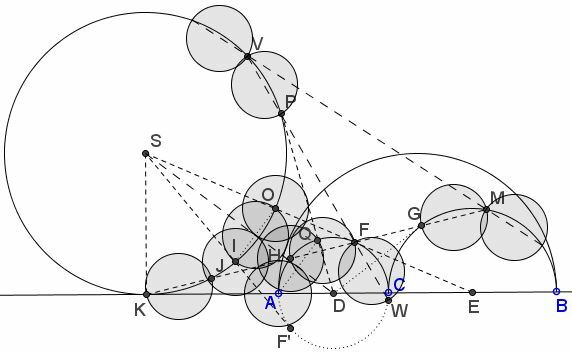 Antonio has combined the discoveries of Dao Thanh Oai (Vietnam), Miguel Ochoa Sanchez (Peru), and his own into a tremendous collection of Archimedean circles.